Confession: I spend way too much time thinking about the encroaching fine lines around my eyes, and the vanity mirror perched next to my desk computer is probably doing me no favors (I guess it's a must-have if, as a beauty assistant at Glamour, I'm tasked with sampling beauty products all day). Still, I probably use it to probe at my emerging wrinkles as much as I use it to try out new mascaras. So in an effort to keep fine lines at bay, I enlisted the advice of experts who say that the solution is not just about owning (and diligently using) a damn good eye cream, but it's also about knowing how to care for the eye area too. Turns out, there's a proper way to apply eye products-- and doing it wrong can accelerate the appearance of wrinkles. Say what?! I know. "Rubbing and pulling on the delicate skin around your eyes causes eyelids to lose elasticity and become more wrinkled," says New York City dermatologist Jessica Weiser, M.D. French-born epidermologist Isabelle Bellis adds: "The skin there is much finer than the rest of the face, so tugging can really damage collagen and break capillaries." The solution? Manage the area gently--treat it like silk, says Bellis. Below, are the three most common wrinkle-causing errors derms see women consistently make; plus, handy .GIFs we created to illustrate the correct technique you should be using. Read on, and add these methods to your routine, asap. Dr. Weiser recommends "gently stretching the skin taut from the corner of the outer eyelid," and instead of tugging at the eyelid to get rid of any mistakes (guilty), she suggests removing smudges with a cotton swab. For tug-free eyeliner application, consider investing in liquid liners that glide on more easily (try Maybelline Master Precise Liquid Liner), or gel liners that don't create as much drag as other liners (I love Marc Jacobs Highliner Gel Eye Crayon Eyeliners, which glide on like butter). Or, you could do as Clemence Poesy does, and try tight-lining your eyes with eyeliner instead (lining the inner rims of your upper and lower lashes can seriously minimize tugging). When it comes to taking off your makeup, patience is your best friend. Dr. Weiser is a fan of soaking natural cotton pads in Bioderma Micellar Solution and gently applying them to the eye area until makeup is fully dissolved. If you've got waterproof mascara on, soak a cotton pad in an oil-based makeup remover (Lancome Bi-Facil Double Action Eye Makeup Remover melts away even the toughest mascaras) and gently wipe the lashes upward and downward until no mascara remains. 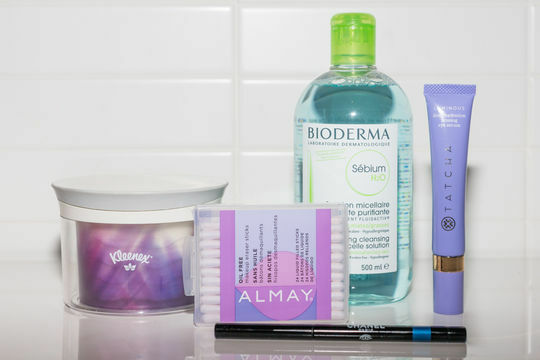 She also cautions against becoming too attached to makeup remover wipes, which encourage tugging, and can also contain skin-drying alcohols and preservatives to keep them fresh (if you absolutely must use a wipe, consider an oil-based makeup remover wipe, like the ones by RMS beauty, which contains nothing but coconut oil). When it comes to applying eye cream, having a gentle touch is key. Eye cream should be applied in a light tapping motion (with the ring finger, which applies the least pressure to the skin) starting at the inner corner of the lower eyelid and extending to the outer corner, says Dr. Weiser (try Colbert MD Nourish Eye Cream, which is super creamy and absorbs almost instantly, guaranteeing crack-free concealer application). If the cream has not fully absorbed into the skin, follow up with a gentle patting motion with your ring finger to allow the cream to penetrate more deeply into the skin, advises Dr. Weiser. Bonus: Applying light pressure on the corner of your eyes with your ring finger after applying cream will tone and reinforce eye muscles, says Bellis.